To celebrate the cinema release of Hayao Miyazaki’s farewell film, The Wind Rises on 9th May, we are giving away to three lucky winners a bumper collection of Studio Ghibli gems… a copy of Pom Poko, Princess Mononoke and The Cat Returns on Blu-ray along with Studio Ghibli Steelbooks of Ponyo, My Neighbour Totoro and Howl’s Moving Castle! 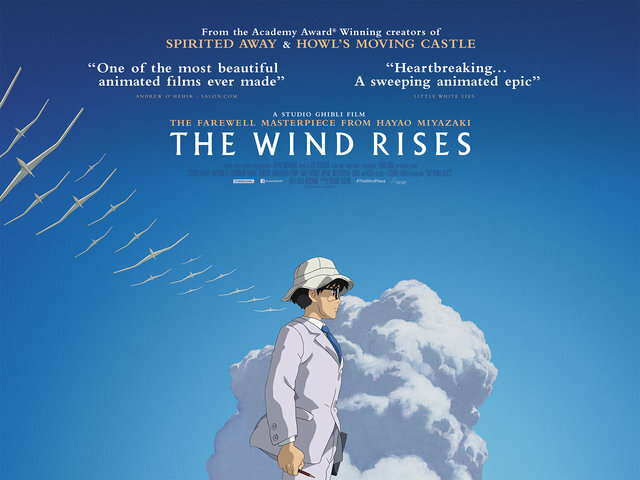 The farewell masterpiece from the legendary Hayao Miyazki, co-founder of Studio Ghibli, and Academy Award-winning creator of Spirited Away, Howl’s Moving Castle and Ponyo, The Wind Rises is a fictionalised biography of Jiro Horikoshi, visionary designer of Mitsubish A6M aircraft. A stunningly beautiful animated epic, the film charts one man’s struggle to achieve his childhood dreams of flight, and paying heartfelt tribute to the power of imagination. For your chance to win, just answer the question below. The competition closes at 23.59 on May 16th 2014. The Wind Rises is out in UK cinemas on 9th May and for the very first time Pom Poko is available on Blu-ray now, plus on May 19th you can own Princess Mononoke and The Cat Returns on Blu-ray.